The slow-moving waters of the Amazon River and its tributaries hide the sharp-toothed piranha. Notorious for their aggressive nature, piranhas generally avoid larger fish and animals unless starving or provoked into a feeding frenzy. The red-bellied piranha is the best known, but there are several species of piranha and their relatives that range from 1 foot to over 3 feet long. The fossilized teeth of the megapiranha (Megapiranha paranensis) suggest that this prehistoric ancestor of the modern piranha grew up to 3 feet long. It lived in the Paraná River system in South America approximately 9 million years ago. The fossil teeth indicate it was an omnivore and possibly an intermediate step between the carnivorous piranha species and their vegetarian relatives. Found in the early 1900s, the fossil teeth gathered dust in a drawer until the 1980s, when it was located and identified by paleontologist Alberto Luis Cione and his colleagues. The largest true piranha is the San Francisco piranha (Pygocentrus piraya), also known as the black piranha or black-tailed piranha. Native to the Sao Francisco River basin in Brazil, this aggressive omnivore grows to more than 13 inches long and weighs up to 7 pounds. Its close relative, the infamous red-bellied piranha (Pygocentrus nattereri) lives in rivers and flooded rainforests across the Amazon basin. The red-bellied piranha is slightly shorter and heavier, at 11 to 13 inches long and 7 3/4 pounds. Both species eat a variety of smaller fish, land animals, insects, crustaceans, fruits, seeds and aquatic plants. 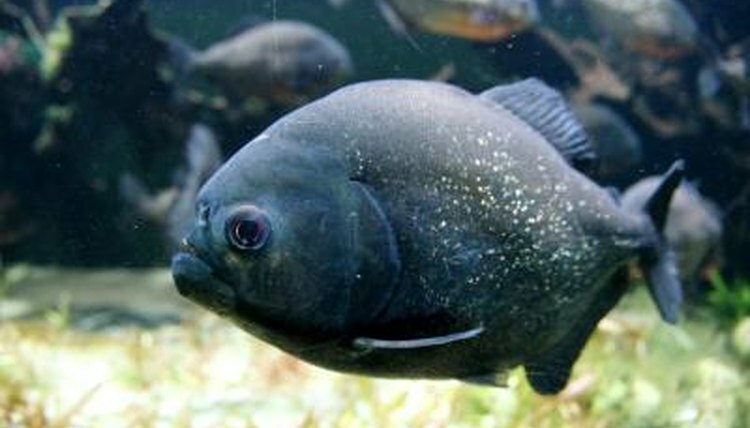 The black piranha (Serrasalmus rhombeus), also known as the white piranha because of its silvery coloring in its youth, is the largest of the Serrascalmus piranhas, growing up to 18 inches long in the Amazon river basin. The black piranha -- which is distinct from the San Francisco piranha even though both species are commonly called "black" because of their appearance -- is a carnivore and eats a variety of crustaceans, insects, mammals, reptiles and small fish. According to a 2012 research paper, "Mega-Bites: Extreme jaw forces of living and extinct piranhas," the black piranha has the most powerful bite among the living piranha species, with a force of more than 30 times its body weight. The pacus are the piranha's close relatives, descended from the same ancestors as the megapiranha and piranha. The blackfin pacu (Colossoma macropomum), also known as tambaqui, is the largest pacu at 42 1/2 inches long and weighing up to 88 pounds. The red-bellied pacu (Piaractus brachypomus), also known as cachama and pirapitinga, grows up to 34 1/2 inches long and 55 pounds. The pacus are omnivores, eating mostly aquatic plants, vegetation, crabs and small fish. They can be aggressive when hungry or provoked.